Optimistic that the work may soon be nearing an end, the Friends of Percheron Park recently gave the green light to sculptor Joshua Koffman to begin creating the centerpiece of the park. Percheron Park along Moorestown’s Main Street currently sits unoccupied as the remediation process continues to cleanse the ground. The Main Street location will serve as a park once the remediation process is complete. If you’re taking a walk down Main Street, you may notice a small, empty tract of land just next to the Moorestown Community House with a sign that reads “Future Site of Percheron Park.” In fact, you may have noticed that site has been promising that a park is coming for nearly the last decade. Township Manager Thomas Neff said the site is still in a limbo state of DEP-approved remediation. Puritan Oil Company, Inc. is responsible for soil remediation at the site. Neff said the township regularly calls Puritan’s licensed site remediation professional (LSRP) to get a status update but hear little back. Puritan Oil Company, Inc. is a subsidiary of Global Partners LP. Eric Harvey, environmental manager at Global Partners LP, and David P. Zailik, LSRP of record for Puritan, could not be reached for comment. Given that they’re nearly a decade into the remediation process and optimistic the work may soon be nearing an end, the Friends of Percheron Park recently gave the green light to sculptor Joshua Koffman to begin creating the centerpiece of the park – a bronze Percheron named Diligence, according to the Friends’ president Kathy Logue. In 2008, the township purchased the future site of Percheron Park at the intersection of Main and High streets. In 2011, members of the Garden Club approached council with a landscape plan for a park at the site. The Friends of Percheron Park was formed that same year. The nonprofit has been raising funds to bring the park to life since that time and has raised around $150,000. Logue said the money has sat safely untouched and tucked away in the bank as the site has sat idle. The site, formerly a gas station, is in the midst of soil remediation. The township purchased the property with the contingency the previous owner would be responsible for the soil remediation (the process of removing contaminants from the soil). Logue said the oil company, unsurprisingly, chose the cheapest and longest option. The Friends have reached out to local remediation experts who said the injection process being utilized can take 10 to 14 years to be fully effective. The park was due to be completed in 2014, but every year, the company has asked for a one-year extension from DEP to continue the remediation. The park will feature a life-sized bronze statue of a Percheron stallion. The horse, to be named Diligence, will serve as a tribute to Moorestown history. In 1839, Moorestown native Edward Harris II brought the first Percheron stallions to the United States from France. The Friends made their first payment to Koffman in January. Logue said it will take him around nine to 12 months to sculpt the stallion and get the piece bronzed and poured. She said they’re hopeful that by the time the piece is complete, there will have been enough headway at the site to get the ball rolling. The vision, according to Logue, is to have a low brick wall at the street corner with some surrounding plantings, and Diligence behind some flowers or small shrubs. The site will feature stamped concrete, so there will be no need for grass-cutting, and there will benches for residents to stop and people watch. While the group was initially very active with its fundraising efforts, Logue admits it has been discouraging at times as the years of remediation have dragged on. “Every year, we’ve gotten: ‘Another year – we need another year,’” Logue said of the remediation work. The township will hear back again about the status of the remediation this May from the licensed site remediation professional, at which point the Friends will learn if the company is filing for another extension. “It’s something on Main Street that needs to get finished, “ Logue said. 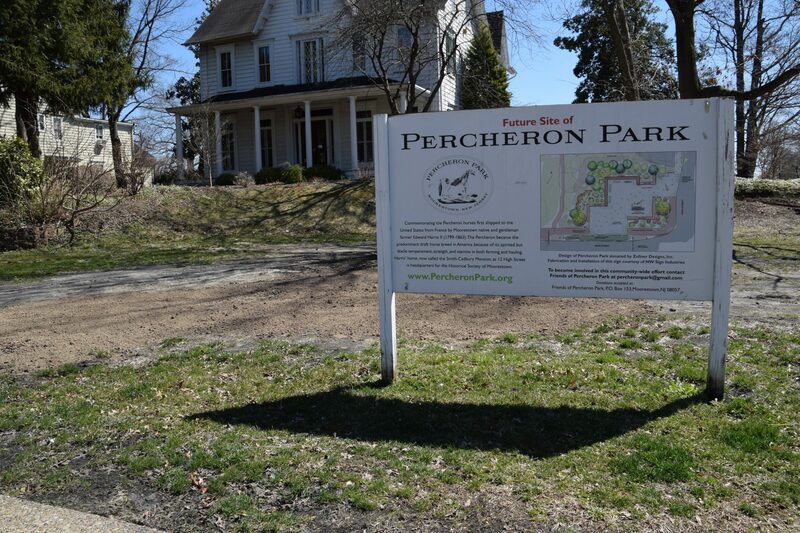 To learn more and stay up-to-date on the project, visit http://percheronpark.org.